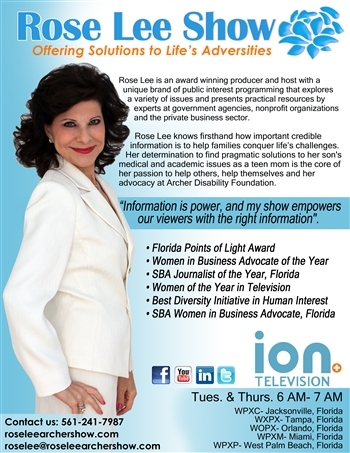 In this episode of the Rose Lee Show viewers will discover new non-pharmacologic pain therapies, connect the links of a mothers inflammation during pregnancy to her baby's brain development, and how to reduce Medicare fraud, while protecting beneficiaries from identity theft as well as new affordable health care insurance options available in twenty four states. Millions of people on Medicare living in Alabama, Florida, Georgia, North Carolina and South Carolina received new Medicare cards in the mail, as the Centers for Medicare & Medicaid services – continues to send out cards to beneficiaries nationwide. Each new card will have a unique new Medicare number—instead of a Social Security number. Angela Brice Smith the Regional Administrator for the Centers for Medicare and Medicaid Services, known as CMS introduced the importance of the new card to protect the identity of the beneficiary and prevent Medicare fraud throughout the nation. The National Institute of Mental Health funded researchers to help connect the dots between inflammation in a pregnant human mother & possible effects on her child's developing brain. Researchers linked high levels of maternal inflammation during pregnancy, to reduced brain circuit communications and altered long-distance brain wiring at birth, to poor cognitive function by the time a child is one years old & reduced impulse control & working memory at two years old. Research shows maternal inflammation is also implicated in some cases of Autism spectrum disorder & Attention deficit disorder. Dr. Claudia Buss, of Charité University Medicine Berlin & University of California Irvine, began the research by identifying women who are in the beginning of their pregnancy. Researchers found that there can be some biological alterations during pregnancy that they may be able to modify through intervention, if found early enough. Learn more at www.nimh.nih.gov/news/science-news. Over 100 million Americans suffer with Chronic Pain from an injury/trauma, with moderate to severe pain that persists for 6 months or longer to recover. This chronic pain condition is called Complex Regional Pain Syndrome, (CRPS). Dr. Corey Hunter an interventional pain specialist @ the Ainsworth Institute of Pain Management & Assistant Clinical Professor at Mount Sinai, and Doug Rodd a Chronic Pain patient and medically retired US Army Paratrooper, who damaged both of his knees after years of Active Service, introduced a non-pharmacologic treatment for CRPS to reduce opioid addiction. he Ainsworth Institute of Pain Management partnered with Abbott to offer a revolutionary new procedure that is set to change the whole way we approach treating CRPS. It's called the DRG Stimulation, the procedure uses Neuromodulation of the Dorsal Root Ganglion, which has been proven in clinical trials to offer superior pain relief. Doug Rodd shared his experience with his lower limb chronic pain and how his everyday life experience was elevating his legs covered with ice packs and more and more opioid pain management until he experienced DRG Stimulation as what he referred to as a miracle procedure. Medical Innovations like non-pharmacologic therapies can alter pain signals while reducing a patients use of opioids. Researchers have linked maternal inflammation during pregnancy to a new born child's brain development and New Medicare cards will reduce fraud and protect beneficiaries from identity theft, while direct primary health care options help to offer affordable health care to all. Jump To Rose Lee Archer M.S. Get E-mail Alerts When Rose Lee Archer M.S. Sends news releases.